For those who don't know the history behind Alex's Lemonade Stand, we suggest you read about it here. It's one of the most inspiring stories of human spirit you'll ever come across. 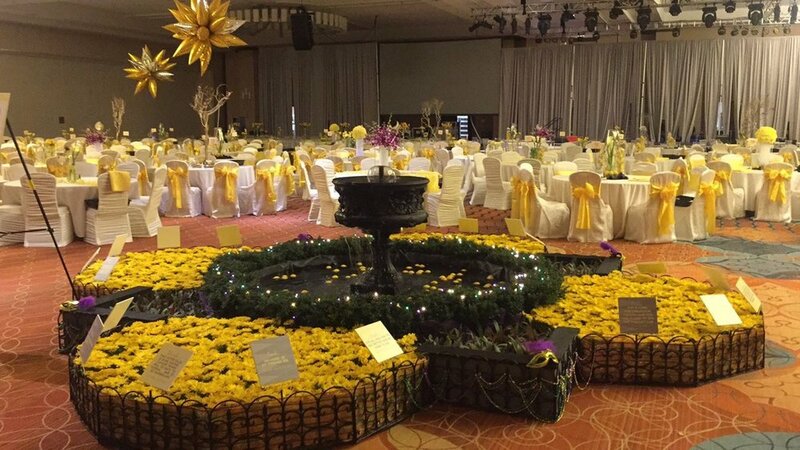 And we're proud to be part of the organization's annual fundraising event, the Lemon Ball , every year. As you may have seen from our instagram post last year, we are responsible for the centerpiece "Fountain Of Wishes", where the hopes and dreams of children with cancer are displayed for all to see and think over throughout the night. Some, with the help of charity-funded research, eventually come true. Others still, do not. Which is exactly why we feel it's so important to be a part of such a great event. In the end it's the least we can do to help carry forward the positive impact that young Alexandra had in her lifetime and continues to impart still so many years later. This year was a big success and a ton of fun! Our crew came together to make another beautiful fountain display, featuring daisy mum and rhoeo (moses in the cradle!) plants that really stole the show. Terren owner John McCaughey and his wife Susie had a blast at the event itself and are already looking forward to next year. If you're interested in donating to Alex's Lemonade Stand, you can do so here. If you'd like to see more pictures of our floral displays, check out the work of our popular annuals designer. Until next year! Take care.